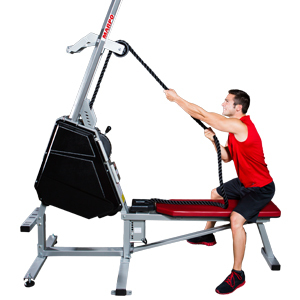 So when I walked into the gym I saw a guy on the VPX rope machine. This is the endless rope machine that I have used several times. It’s a challenging workout. Well this guy was using the machine in a manner that just looked wrong. Instead of sitting on the bench he was on top of it on his knees. Instead of pulling down on the rope he was pulling up on it. Although I assume the guy thought this was a way to give his biceps a workout, it totally looked like he was jerking off the rope. I did my longest rowing session ever, upping my time 50% to 30 minutes. Rowing is tough in a totally different way than running. I sweat less since the movement is non-weight bearing but the overall body exertion feels much more balanced and effective. During the last 10 minutes of pulling my hamstrings, hips and hands were ready for a break. I kept a pretty good pace, averaging around 30 pulls a minute while covering 6700 virtual meters in the 30 minute session.